My save the dates that I ordered through vistaprint. I made the designs myself on photoshop. More pictures in the paper section! 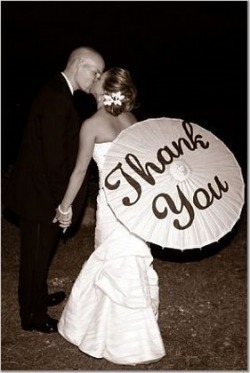 The parasol I made for my thank you cards. I made the words in microsoft word and blew them up to 400. Traced them and painted...The below picture was my inspiration. Engagement party photobook I made through Picaboo. Check out my blog for more pictures! Centerpieces for my engagement party. I submerged pink peruvian orchids (from fiftyflowers.com) with floating candles. I got the vases from dollar tree direct. All together cost me about $150 for 12 tables, and two arrangements for the bar area. Wooden letters I got from Michaels. I painted them using acrylic paint and used them for my gift table at my engagement party. Maybe I'll cover them with patterned paper for the wedding ?? I covered the votives in fuschia velum and a printed velum with engagement rings on them. I will have the fuschia candles for the tables and the engagement ring candles for the cake & picture table. I purchased the candles for $5 each from Bath and Body works. I made the labels in photoshop and printed on photo paper. I DIY my favors with the help of my mother and sisters. 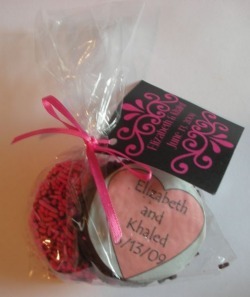 I ordered sheets of edible paper with our monogram from an etsy seller and applied them to a chocolate covered oreo. Dusted with sprinkles to finish them off (check out blog for more pictures).